Grant Robertson wants to be the next Finance Minister. And it’s looking like he’ll be a busy one if Labour gets elected. Changes to monetary policy, spending billions more on health & education while finding savings in the corrections, defence and social investment budgets, and trying to find the trick to unlock those elusive export growth and productivity targets. All at the same time as renegotiating the TPP. How will he go about it? Will he spook the financial markets with Reserve Bank Act reform coupled with a promise to get unemployment to 4%? Will he commit to the OECD’s agenda for improving productivity? Will his Tax Working Group look at corporate and savings tax setting? Alex Tarrant sat down with him to find out. This is an interest.co.nz interview so there’s no excuse in not beginning with Monetary Policy. Labour is is proposing two key changes to New Zealand’s settings. The first is shifting from the Reserve Bank Governor’s sole charge over the final decision setting the Official Cash Rate and moving to a rate-setting board. Labour wants people from outside the Bank to sit on this board alongside the Bank's governors. One concern is whether we’d have the depth of talent of candidates for such an outfit not connected to the large banks or businesses. One of the planned appointees under Labour’s plan is a Treasury representative providing a liaison between the Bank and Treasury at rate setting meetings. While not a voting member of the board, I ask Robertson whether he’s confident there won’t be a perception that the Minister of Finance will effectively have some sort of input into monetary policy decisions. “The [OCR] decision is still being made by the Bank and the external people that we’re bringing in. We want the maximum amount of information to be available to those who are making this decision. And we want to make sure that the flow of information is good,” he says. Now to the main change Labour is looking at – adding full employment alongside inflation targeting as central mandates. Robertson has said neither is going to be more important than the other, which I want to ask him about. Meanwhile, we’ve already got a way to determine whether the Bank has met its inflation target (the target band). Has he had any more thought on whether to add something similar for the employment mandate? After all, Robertson said in his conference speech earlier this year that Labour would work towards getting the unemployment rate to 4% within its first term. “The most important thing for me is, ensuring that the Bank is having active consideration of the impact of monetary policy on employment. Now, we’ve got a clear goal to see unemployment reduced down to 4% within our first term,” he says. I jump in: Is that not a goal now? If we don’t get there, then has the Reserve Bank failed its mandate? To me, that sounds like inflation targeting will therefore be held above employment in terms of this ‘battle of equals’. We move on to choosing the next Governor. This is something Steven Joyce is staying out of until after the election (if he gets back in). Robertson has attracted a few recent headlines saying he wants a say on who the new governor is. So, is he happy with the current set-up where the Finance Minister can veto a board recommendation, but has no other power over the process? And, finally on this, he’s happy that financial traders will understand Labour’s position on this dual mandate? They won’t get confused by a 4% unemployment rate target a Labour government has, even if the Bank’s out there saying the non-accelerating inflation rate of unemployment (NAIRU) is 4.5%? Onto the broader economy. I’d asked Joyce about that goal to grow exports from 30% of GDP to 40% by 2025. It’s not looking like happening. Does Labour share the same ambition, and if so, how would they do things differently? “We want to see exports lift. The value of exports at the moment hasn’t even got back to where it was in 2014, so we’ve got issues in terms of lifting that value,” he says. The issue goes hand in hand with productivity. “What we’ve got to do is, what’s bogged New Zealand down for a long time, [which] is, ‘how do we drive the diversification of our economy?’ Which goes alongside, ‘how do we add value to the economy?’ For me, the starting point there, is around research & development and innovation,” Robertson says. How about free-trade within the export story? Labour wants to renegotiate the TPP 11. If they don’t get what they’re after, will they walk away? Or is there room for compromise? Productivity. It’s one of Labour’s big criticisms of the National-led government – quite rightly too when you look at the stats. What would Labour do differently, then? The OECD when in town a few months ago provided us with five suggestions they reckon could get things going again. I put them to Robertson. Number one is narrowing screening of foreign investment and reducing compliance costs – ie boosting predictability for foreign investment – what are his thoughts on that? The second suggestion is enhancing local government incentives to accommodate growth – sharing the tax base linked to local economic activity. Previous leader Andrew Little was a fan of the ‘GST for the regions’ policy – is that still in the works? “Exactly, and we’ve been very clear that is one of the tools that should be in the box, along with the infrastructure bonds that we’ve also talked about,” Robertson says. New Zealand in general doesn’t think enough about the connections in our tertiary and research sectors. “We’re not that huge.” Robertson references presentations by the likes of Shaun Hendy on how countries of a similar size to New Zealand build much better and stronger connections between the different research institutions. Number four on the OECD list is reviewing competition law to allow the Commerce Commission the ability to conduct market studies – something he’s open to looking at. And number five is what I’ve been wanting to get to, really. The OECD tells us that our high corporate tax rate reduces capital investment – they want government to review corporate and personal income tax rates and look for potential new tax bases. Now, Jacinda Ardern has ruled out raising the corporate tax rate. Would Labour consider cutting it? “It’s not in our plans,” Robertson says. What if a hypothetical tax working group were to recommend it? We had to touch on tax – I ask Robertson whether Labour will stop ruling things out when it comes to parameters for this Group. So far, we’ve had the family home ruled out from a Capital Gains Tax, the land beneath it ruled out from a Land Tax, and we’ve just had his comments on corporate tax. I ask about excluding the family home. Labour talks about fairness across the tax system regarding income, assets and wealth. Owner-occupied housing is the single biggest asset held by New Zealanders which isn’t attracting tax. How can you leave it out? “Yeah, but the point is, that we’re making a decision that says that your home is yours, it’s an important part for people of the security of their lives to know that it’s theirs, that that’s how we build strong communities,” he says. Just back to KiwiSaver, what are his thoughts on compulsion? “I still believe in everyone being in KiwiSaver – universal scheme,” he says. But he’s holding off from compulsion. “We’ve now reached a point where those that aren’t in the scheme are largely made up of the lowest income New Zealanders. What we’ve said is, we now want to take a look at what is the best way to bring them in? I don’t want to click my fingers and say that it’s compulsory to a group of people who are looking at us saying, ‘I’m just making my way at the moment, I’m just meeting my bills’. Labour’s fiscal plan has been in the news recently, with Robertson batting back erroneous suggestions from Steven Joyce that there’s a hole in it. The conversation has moved on to what room Labour might have for spending above and beyond what they’ve already promised to the government’s current track. He’s talked about efficiencies and reprioritising spending from some areas to others. Any updates on that? I put to him that he’s mentioned prisons before. Do we need to move on from this recession affair with looking into every potential million dollars of an opposition party’s policy platform? I finish by putting a few numbers to Robertson from the Reserve Bank’s latest projections in its August Monetary Policy Statement. GDP growth forecast over the next three years at 3.1%, 3.6% and 2.9%, annually; the trade-weighted exchange rate dropping from 77.5 to 76; the unemployment rate constant at 4.5%; and a household savings rate as a percentage of disposable income going from negative 1.6% to negative 0.7% - getting better, at least. Why change? “There are some good, solid indicators in there,” Robertson says. “But then there are other ones, like GDP per capita, which is not so good. We’ve still got far too many long-term unemployed, we’ve still got 100,000 underemployed people. We can be better than we are. I believe they've said any changes will be tax neutral. @sharetrader , dont fudge the issue , JK reduced income tax significantly to rebalance our tax system and tax spending instead of your hard work . It was a broken promise though, along with the 17 other increase of tax. It was also a bit stingy - raising GST impacts the poor most of all, as they must spend more of their income to get by. JK reduced income tax while at the same time dramatically increasing govt debt. Few govts have been able to do this as successfully as NZ. Never mind the youth of today will pay it off. Small town - you do appreciate that he was faced with a once in a lifetime GFC and still managed to keep Govt debt to a levels amongst the lowest in the OECD, and is now producing surpluses and starting to reduce it - you do realise that Labour managed to run surpluses during a global boom period from 2002- 2006 and then set up a massive future contingent liability in its final term with the likes of interest free student loans etc as it tried to cling to power in its final year. NZ didn't have a major GFC because Kiwi banks didn't buy into CDS and other crazy securities. We were essentially just watching what was going on elsewhere and borrowing to spend during the small slowdown that accompanied it. Understand Rick, NZ isn't an island, its trades with the rest of the world and was badly hit along with everyone else in terms of commodity prices, bank funding costs (there was a frightening period where they could not access funds from anywhere - understand the connetations of that) - Yes its banks were more prudent and we didn't have the same exact issues particularly in housing, indeed that's what's causing the housing problem now, too low interest rates trying to bail out others, pushing asset prices through the roof. It was a massive crisis very well managed. I used to have a budgie called Boatman , he spent all day talking to himself in the mirror, happy to ignore what was happening around him - as long as he could talk to his precious mirror. Neurotic little fella ended up losing all his feathers . Tweety Pie is alive and well. Tweety Pie's entire world begins and ends with her birdcage. Sylvester is a cat that exists to amuse her. Grandma, her owner, exists to feed her. So here's the thing , I am hardly neurotic, I just look at things from a realistic and pragmatic viewpoint. I personally have nothing to lose from a Labour Government. I have only one home in a trust , our investment assets are held for the long run , and so there is no personal issue with CGT because I will never have to pay it , because I will only sell off my assets as and when and if I need the money over the next 20 years . Like you, I also dont want Auckland properties to go up, it just means more rates to pay but I have much more to gain from a National because at least they are not hell bent on taxing everything in sight without giving a hint as to how much they will take. The problem is that what Labour is proposing WILL NOT bring property or house prices down , a new tax or additional tax on Land simply makes land more expensive . And if you drive investors out of the housing market who on earth will provide rental stock ? Forget it , even Helen Clark was not able to achieve that , and so she made it easy for the private sector to supply rental stock when she realized her Government was unable to do so . If National stays and houses keep going up, how does that benefit your children and grandchildren? Beyond simply having to rely on inheriting your wealth from you (hope you weren't planning to enjoy luxuries in your retirement)? I share your view too Boatman. Thank God I am an EX-banker , all that PC nonsense , minding your P's and Q's , your colleagues arse creeping the pompous bosses in London and corporate backstabbing is not fun at all . The only thing good about it was the pay , the bonuses and the share options , other than that its a crock of you-know-what . C'mon, fess up. You're boaties mum, aren't you? As with most parties a few good ideas and some I think aren't the best. A board to determine interest rates has some merit and should be pursued. But some transparency would also be good. However, targeting employment doesn't seem like any point - merely a "feel-good" policy. Let's also remember that unemployment is now at 4.8% so getting to 4% is hardly impressive. But tax is the big issue. As Winston Peters suspects, and I think he is right, they know what they want from the tax working group - the things they have ruled out means there is only a few things left. On corporate tax a really bold move would be to move to zero. I won't hold my breath for that one. Labour are telling lies , of course they know exactly what they want from the Tax Working Group , the brief will be explicit and clear , and if someone like Ganesh Nana is part of that working group ,we are in serious trouble . National = There's a housing affordability issue, get us into goverment and we'll fix it = We're in government, oh you like expensive houses, what housing crisis? By your definition, National are liars as well, or do they just have multiple personality disorder? In which case you could say we've had a bunch of psycho's running the country for the last 9 years..
@independent ..... here's food for thought , Sydney and Vancouver house prices ( for example) have done the same as Auckland, in fact Vancouver is worse . Labour are wanting us to believe they can sort it with a simple click............. they cant . We have low costs of borrowing , massive immigration , a Labour -leaning run city which until recently restricted development and had no plan . Its going to take a generation to sort out . Labour are making promises they cant honour. "Net revenues from the Empty Homes Tax will be reinvested into affordable housing initiatives." This follows upon their tax on foreign buyers. So yeah, multiple places have faced this same issue, and it will certainly take time to address. Best get started then, eh? No use postponing action for another three terms. What I don't get boatman - is it only Labour that tells lies then? But if National do it, its all good? How does that work? Got those blue tinted glasses on? @Independent .....no need to get personal , sarcastic of facetious ......... I dont think I have ever said that National is honest . If you look at my comments in the past, going back years , I have always said that National were not honest with us about immigration . I have always said that I dont trust Winston Peters. no change to the last nine years then eh? FYI, I'm not sure what in particular you are claiming Jacinda is lying about...? But she's noted today that inheritance tax is not one they'd consider implementing were the working group to recommend it. It was another spectre that Stephen and Bill had started shaking at the electorate and shrieking about. Labours CGT policy for one! The assumption, which is incorrect, is that Winston will have any influence at all. I cant see Labour needing him. Thats why he is currently sucking up to the Nats with the Nat driven Tax rhetoric. Under our imputation regime the corporate tax rate is irrelevant to a domestic investor so going to zero would not be such a big deal for that class of owners. I agree but for non-local investors it would make us a lot more attractive. Although I do acknowledge that $13b is a big hole to fill. My concern with the current election I have yet to see much on growing the economy only spending it. The question then is WHY not disclose what they are proposing to do....detrimental to the campaign?? Will this take the sparkle away from the current stardust? People have a right to know before an election what you plan to do with their money! Jacinda doesn't have to disclose anything. When the majority of the nation trust you and can see that you genuinely care about the country they will vote for you. Disclose nothing. DGZ, your Dr Jekyll personality is out today. Mr Hyde is safely locked away at home? They've said, what, removing negative gearing, extend bright line. And see what recommendations a working group makes, in conjunction with consulting with the NZ public. They've explicitly excluded the family house and land from any CGT, were such a tax recommended. So what plans do people want disclosed? Sounds more like some are parroting talking points. Primarily property investors trying to scaremonger up support from those who would not be affected by Labour's stated tax changes or a possible CGT. I cannot imagine any reasonable Kiwi who does not have investment properties would get their knickers in a similar twist. And why would the want to, when National has demonstrated zero interest and less than zero progress in affordable housing - something their children and grandchildren need. "consulting with the NZ public." - the only meaningful and proper way to do that is called "general election" and they are refusing to put their tax changes as part of the election manifesto ( for this election or the next ). "Sounds more like some are parroting talking points. " - which is exactly what you are charged with on behalf of Labor. That's fair - so I guess the public will decide if they're okay with the idea of bright line to 5 years, negative gearing being removed, possible water tax, and possible introduction down the track of a CGT that would exclude the family home and land. I suspect many will be. As for me, I try to bring some sane analysis to some of these discussions. Rather than "LABOUR IS LYING!!!!" or "a thinly veiled plot institute tax, tax and more tax". I always welcome logical counterpoint and analysis. In fairness to your point - I do end up having to do a fair bit of rebuttal on this site to straw men and misrepresentation of what many on the Left are saying and doing. Ironic. yep, more astroturfing from the usual suspects. Labour's furtiveness on their tax policy, and being asked to just trust them to work out what is best and even details on their announced policies after the election (after sitting in opposition for 9 years) is simply appalling. Whereas the public voting for National to fix the housing crisis in 2008 because they said they would, but then they didn't -in fact they spent 9 years in power denying a housing crisis exists is not appalling? same argument could be used for youth suicide, the declining state of our waterways etc. Do you really think Foyle that it is okay to constantly scrutinise the main opposition party to the nth degree while giving the party in government a free pass to be useless is ok? If you do -well vote on tax -for me I am relaxed about it. I don't see tax as the priority. I am much more concerned about housing, mental health, education and being able to enjoy the country's waterways like my parents, grandparents and great grandparents did. watch marae form last week, they asked all eight if it was a housing crisis, everyone says yes even act and the maori party(government partners) and the poor national MP on the end says its not, its a challenge. National have failed in a lot of things. But have done a decent job of managing the economy, bringing us back to surplus from a very deep hole we were in when they came to power, and are very much a known quantity with clear policy going forward. They are also finally starting to put some money into sorely needed national infrastructure projects. Labour are asking us to trust them even though they have basically no one with any commercial or ministerial experience, have strong tax-and-spend preferences and are being at-best furtive and coy about their true tax policies - we are expected to take it on faith that they will turn out OK even though they have already indicated that they are going to hammer various mostly non-labour voting groups and target productive industries to fund their lolly scramble (ie the bogeyman of Clientalism). And additionally have a back-to-the-1970's industrial relations policy penned by the council of trade unions as their payoff for all the money that unions funnel into their coffers. Add to that acid mix we will have the hard-left greens in their coalition to really wind the sphincter factor up to 10. Does none of that scare you? I'm not a fan of National either, they have fiddled while Rome has burned, though I think they deliberately went the high-immigration route because it was an easy way to pump foreign money into the economy and retain the treasury benches without borrowing, their big failure being in not pushing the necessary Auckland infrastructure development needed to support the increased population - but then 2 labour mayors in succession haven't helped with that either. Given a bad choice between asleep-at-the-wheel National and a much worse tax-and-spend Labour who don't appear to have been awake during economics or history at university I am certainly going to side with the more fiscally responsible mob - even if I won't vote for National themselves. So which political parties are part of the fiscally responsible mob but aren't part of the fiddling while Rome burns mob in your opinion Foyle? Least bad option seems to be Act to me, on principle that they might at least pull left-tending National slightly to right, and have broadly Liberal principles with rationality and pragmatism on other emotive issues like euthanasia. I don't like their support of exceedingly expensive refugee immigration - so much cheaper and helpful to more people to address those problems by spending same money at the source rather than taking on uneducated and frequently non-integrating refugees that will cost up to a million-per-head over their lives. But I can see why they need to do it given Epsom is 30% Asian. Winston is a lazy and entitled Muldoon-like populist decades past his use-by date and surviving only as a cats-paw for the media. He frequently appears to be slurring and confused during question time in the house and by all accounts was rather lazy when he was in govt. Should never be allowed near treasury benches again. Greens are unevolved communists - using green veneer to gain power (like ex Australian democratic socialist (marxist) party leader Russell Norman). They've ejected the more thoughtful and ethical environmentalist MPs from their party in the wake of the MeTu scandal, and like Trotsky/Lenin seem mostly about using environment as a cover for their social agenda. I would happily see them vanish from parliament as like Alliance before them they are well past their use-by-date. I do respect a few Labour MP's (D.Clark among others) but their subservience to destructive Council of Trade Unions money, agenda and control (Unpopular-in-caucus union man Little still at #3 on list! and was only replaced during brief pre-election window where caucus can outvote union) and general antipathy towards farming and productive industries + belief in tax and spend in face of all evidence of its perils is a frightening package. I do favour their land tax idea, so long as balanced by income+business tax reductions, and don't dislike CGT barring proposed exemptions but would need to see more detail on how it was to be enacted before I would vote for a party proposing it. Where astroturfing equals countering wild generalisations, accusations, straw men, scaremongering etc. As I say, I always welcome factual and logical debate with points I raise. It's usually quite a warm welcome because they sometimes seem like long lost friends. This lot are dangerous to all proponents of the benefits of a system where you work hard and reap the benefits of your (own) efforts. All of what Robertson is saying is a thinly veiled plot institute tax, tax and more tax. As Winston Churchill once said "We contend that for a nation to try to tax itself into prosperity is like a man standing in a bucket and trying to lift himself up by the handle". Isn't there an elephant in the room with these video comparisons of Robertson versus Joyce (yesterday's video). Joyce in his video played the role of being the serious and considered Finance Minister of NZ -having a serious discussion about NZ's economy. I expect Joyce's expectation was this performance would give him the respect of his countrymen. But this performance come days after a bald-face manipulative lie or $11bn act of mathematical incompetence from Joyce, which no financial expert in the country agreed with. Given Joyce's act of manipulative lying or gross incompetence why should New Zealand voters take him seriously? How can we trust any of his numbers? Why does Joyce think he can be a lying shock-jock or bumbling incompetent one day and the next day the public accepts him as a trustworthy and competent Finance minister? Robertson in this interview didn't set the world on fire with excitement. But that doesn't matter because as long as he is competent and trustworthy, which he was, he is leaps and bounds better than Joyce. Shayne Currie, the moderator said Joyce's claim was "straight out of a Trump playbook". Bloody good video Kate -of Robertson versus Joyce -where Joyce is called out for being a fool because of his Trump-like insistence that fake news is true. In 2011 National allocated money to health/education and then had $900m operating allowance. For one year, that year. That was in the depths of the pit of global financial crisis. They faced an $18bn deficit most of which was a carry over of Labour’s 54% spending increase and $7b operating allowance increase in 2008, and they faced permanent, ever increasing deficits – forecasts of debt to GDP of 70% (vs 25% now) by early 2020’s and $14b per year interest payments. Ardern and Labour called it the ‘zero hope’, ‘zero future’ budget and said it would kill government services dead and lead to the death of poor people in New Zealand. Well (deceitful? lazy? or just plain incompetent?) Grant Robinson has just presented a fiscal plan where they have allocated money to health and education, and then left $900m operating balance for *3 years*. So in order for Labour’s numbers to work they have to run the most ruthless austerity this country has seen in decades. Much more severe then National in 2011 which they said was causing deaths. It’s three times worse – as Hamish Rutherford pointed out. And yet compliant media economists have got up and said ‘there is no hole’. Except Labour have to run budgets in 18/19 and 19/20 that belong to the ACT party. Actual massive cuts in government spending in real terms, for everything not health and education. Do any of these media economists actually believe that will happen? Could anyone with any sort of brain believe that Grant ‘spend it now’ Robertson is going to inflict massive austerity on his pet public service in 18/19, 19/20? The mendacity from media and their pet economists on this issue is unbelievable. It’s not just that there is an $11billion hole. Labour cannot keep key promises, like: fully erasing the median gender earnings gap (lifetime), introducing living wage in the public service, and putting together huge pay deals for Nurses and ECE. I think Kate is leaning towards New Zealand First. Labour's fiscal plan is audited and based on the same assumptions as the government's (Prefu) -so any supposed tightness applies as much to National as it does to Labour. It’s not just that there is an $11billion hole. No, there is not an $11billion hole. Do I think in those tight years that you mention that Labour will "inflict massive austerity" - no. The overall tax take as put forward in PREFU was conservative - i.e., predicted to be tracking lower than present due to NZSF and the banks having contributed what they referred to as "one-off" tax receipts. Hence, no budget forecast can be cast in stone. Those fiscal years you mention might be tight, they might not be tight. It's all prediction. The argument here is whether or not there is an $11billion hole in the fiscal plan and there isn't - irrespective of the various side issues that Steven Joyce is now trying to run as a sort of 'back track' on his earlier mistaken calculations. What about Nationals $50bn hole the last 9 years? Hasn't our government debt gone from $30bn to something over $80bn the last 9 years? Why isn't that a talking point if we're worried about what might or might not be a $9bn hole? yes it has, though actually it was over the first 5 of those years in the wake of the huge structural deficit left by the outgoing Clark govt, the GFC, and a little contribution from the Chch earthquakes. During that period NZ actually did better than vast majority of OECD in limiting the build up of debt. Describe this "huge structural deficit" in more detail? Do you have some detail? I was one who ascribed to this belief in the past, but I've not actually seen the facts of it presented anywhere. I know National blamed it on Working for Families and Kiwisaver, describing the first as "communism by stealth", but they've not done anything to reduce that and are now in fact looking to increase it. National did of course increase taxes by removing the tax exemption on the employer contribution to our Kiwisaver - hitting the average taxpayer again and increasing tax takes there. It also looks like they reduced spending by cracking down on beneficiaries [Source], something that's certainly supported by anecdotes about it being much harder to get social support now. Are you talking economic cycles? When the GFC hit, John Key was claiming there could be a decade of deficits to come. As it happened, apart from some slowing of the economy, NZ was not hit hard in large part because our banks were not extended into silly areas the way those of the USA and other places were. National certainly did the reasonable thing - spending to stimulate the slowing economy rather than the traditional right-leaning "austerity" approach. Arguably their $1.6 billion bailout of South Canterbury Finance was socialism at its finest...but they were always going to go socialist rather than capitalist and lose votes over that one. On the other hand, borrowing money to fund tax cuts just as a global recession hits seems odd...not necessarily fiscally prudent, though you could argue it's part of a stimulus approach. Firstly let me start by saying that New Zealand does not face the balance sheet crisis of 1984, or even of the early 1990s. Far from having dangerously high debt levels, gross debt to GDP is around a modest 25 percent and net debt may well be zero by 2008. In other words, there is no longer any balance sheet reason to justify an aggressive privatisation programme of the kind associated with the 1980s Labour Government. He did end up selling off government assets after saying that, but ah well...the above statement was made before he gained power. "In the year ended June 2004, core Crown operating spending was about $35,800 per household in fiscal year 2013 dollars, yet the government still had a fiscal surplus of 3.8 per cent of GDP. By the year ended June 2009, the government had lifted spending per household by 21 per cent to $43,400, in the same dollars, and there was a fiscal deficit of 2.1 per cent of GDP. Electioneering spending enticements, such as interest-free student loans, Kiwisaver subsidies and working for families, were part of this spending transformation. Despite recession and tax cuts, core Crown tax revenue in the year ended June 2009 was almost exactly the same, at $37,100 in fiscal year 2013 dollars, as in the year ended June 2004. On these statistics, the switch from fiscal surplus to deficit between 2004 and 2009 was caused by an unsustainable spending splurge." Thanks for the source. National seems to have gotten it down to $41,700, although has maintained most of the things Labour did. I haven't checked the numbers but I'd imagine a part of that Labour spending was also on the Cullen Fund - which arguably is a good idea, investing in pre-funding the Pension for a known demographic timebomb that will hit in the future. I think the problem some have too is they perceive too much of this reduction in spending has been via kicking people off the benefit (see the welfare mix change: http://www.stuff.co.nz/business/industries/92951932/budget-2017-nine-yea...), and - more affecting of the everyday Kiwi - continuing issues in healthcare. Healthcare is a really tough nut to crack, in fairness. In fairness too, different sources cast different lights - NZ Initiative are certainly never going to cast Labour in a positive light. However, the spending figures are objective and thus fair. To be clear I am not a fan of a lot of National's choices over last 9 years. Taxing everyone and then giving it back via WFF is bad example of politicians overtaxing and then handing out lollies to raise their profile (tax credits would be better). But politics is the art-of-the-possible, and you don't get to do much if any good in opposition. Overall National has undoubtedly been a much better steward of the economy than Labour had been (given their proliferate spending and creation of large structural deficit) or would have been had they continued, so they get a better-than-passing mark from me. Probably like yourself, I'm a more traditional National voter who simply hasn't been happy with a number of their choices over the last nine years. And while I can understand them abandoning their principles re WFF and Interest Free Loans (they want to hold power, not get voted out), I can't give them a pass mark on housing. And that's the biggest issue many New Zealanders face today...And National have shot themselves in the foot by calling is "a good problem to have", at times saying it's good that prices are going up, and refusing after campaigning on the housing crisis to even admit it exists. Seems to me a massive misstep in a country where even many of the Haves are starting to worry about their kids and grandkids having the same opportunities to own a home. I agree that WFF, the accommodation supplement and also home start grants are unnecessary subsidies, only needed because successive governments have lacked the political will to unFubar the housing market. And given their proliferate spending, I think you mean profligate spending. Proliferate is what rabbits do really well, and is a verb, whereas you needed an adjective in that sentence. Nice to know that National got a better-then-passing mark from you. Foyle only half-heartedly defends National though. In the final analysis he is disappointed and would go with Act. Sorry, I am a bit new here. I think on reflection it appears everyone is mostly just vigorously defending their preferences rather than uncritically pushing their barrow. I withdraw and apologise. Welcome. I actually enjoy our discussions. I am - in contrast to what some here assume, and probably quite like yourself - traditionally a National voter. I think what's put me off in recent times have been ethical issues (Judith Collins, English & Todd Barclay, Key and Slater), and the failures vis-a-vis the housing crisis as well as what I've come to feel is an overly punitive approach to those in genuine need of welfare support - lumping them all in with "bludgers" who abuse the system. Those and a few other bits and bobs. Robertson and Jacinda need to have a chat over inheritance tax on the family house. In that interview Robertson says no, but Jacinda has previously stated that 'it's up to the tax working group to consider'. "Inheritance tax is not what we're trying to do here. That's not what we're looking at - that's off." I suspect it's actually easier to talk about what is on the table - and that is an extension of the bright line test for all non-owner occupier real estate and/or a full fledged capital gains tax for all non-owner occupier real estate and/or a land tax for all non-owner occupier real estate. At least that's about all I can think of that's left! Colin James who has been a political commentator for longer than I can remember says National is in damage control and need a deeper rethink. https://www.odt.co.nz/opinion/damage-control-and-deeper-rethink-needed. "Campaign chair Joyce damaged not Labour but himself. He presented as a Minister of Finance who couldn't read a simple numbers table. He also damaged his party. We can be as near certain as anything ever is in politics that Joyce will not manage National's next election campaign. More puzzling was that English, who used to be good at reading tables, jumped in Joyce's hole then stayed there through the week. Is Mr Reliable now Mr Rattled?" Bill English also started digging himself into Paula Bennet's hole, before realising the mistake. Proclaiming that it is good we don't have a written constitution so we can change what Human Rights we give certain people. Then the next day after being condemned by Human Rights lawyers everywhere, suggested that Paula Bennet was wrong to suggest his government would take away peoples Human Rights. It's worth highlighting that they are currently battling the NZ courts to allow them to deny prisoners the right to vote, something that the courts have found to be inconsistent with the Bill of Rights and international courts have found to be contrary to human rights. Key point - there's a consistent value in there. With tax, the devil is always in the detail. Without full disclosure, Taxinda doesn't deserve anyone ones vote on the tax issue. Full disclosure please, Labour has had 9 years to think about it, they know what they intend to do! ..the comment of a man running scarred. You need to be scared too! It will be a fascinating election as it does seem to be boiling down to a referendum between property speculation is okay versus property speculation is not okay. Even those surveyed in the Herald's Mood of the Boardroom saw it that way - unaffordable housing and homelessness being among their key concerns. Makes sense as their workers have to live somewhere. If housing is the issue that decides the election then the good news from Shamubeel Eaqub is voters have positive choices ranging from Labour, Greens, Maori Party and New Zealand First. week 1: "jacinda will tax your home"
week 2: "where's the $11b jacinda?" week 3: "jacinda says kill yourself"
I think this negative campaign style is more a reflection of the National party as a whole rather than its leader Bill English -who I think is doing his best and has upped his game. I think Bill has recognised that leading the nasty party against Jacinda's nice party is not going to work. NB; An Australian economist also describes National's latest housing policy as failing Econ 101 and has endorsed Labour's housing package as the more effective option. I think that the Young Nats are pretty bad contributors to this issue, also. You got it Kate..and throw in the environment too. The all out media war on Jacinda has begun, Winston looks more and more like national everyday. In spite of the efforts of MSM and the wondrous opinions they are wheeling out in support of the rockstar, we have a brexit/trump brew well and truly on the boil. On election night the young, happy, healthy, multicultural blue spandex outfitted young Nat runners will be lying face down in the mud, completely overrun by those who have seen through the charade. .
"I think the National Government has been a very credible and stable manager that deserves respect for its approach in managing the country," said a tourism boss. "However, it is arguable that they have come late to issues such as water management, local infrastructure and transport investment with a piecemeal, below par approach." ICBC chairman and former Reserve Bank Governor Don Brash said the Government has failed to adopt policies designed to increase per capita growth, and many of the other problems (increasing wealth inequality, poverty and homelessness) are a direct result of the Government's failure to deal with the unaffordability of housing. "The Key Government was negligent with the house price outcomes which is a very difficult, inter-generational issue now to resolve," said an energy sector boss. "English was Deputy Prime Minister and Minister of Finance during that time so has to shoulder some of that blame, and therefore putting the party's interest ahead of New Zealand." The last seems to have become the stumbling block, especially after the campaign promises on it 9 years ago. Even in the business community. An interesting quote from a Westlake Boys High School teacher: "idiots with rich parents"
Yikes, not good. You would have to wonder whether the teacher is one of the many in AKL who have been locked out of home ownership. As I said earlier, it seems to me to be the defining issue of this election campaign: Labour voters in the "speculation is not okay" camp - National voters is the "speculation is okay" camp. Which only serves to feed impressions that many of those of Chinese ethnicity are firmly in the speculators camp. I never picked this NZ election to be quite so polarising. We had of course seen this elsewhere in the world but I just didn't pick it coming here. 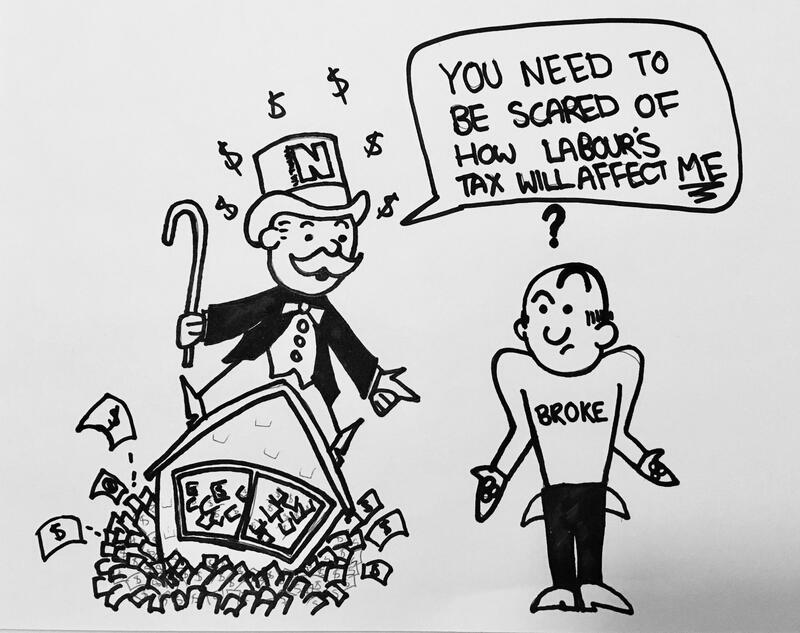 Until Jacinda started to get the cut through on Labour policy that she is, I just don't think many were aware of their crackdown on speculators stance. Once that was made clear - we saw the rise and rise in the polls. I've said this before but my Boomer parents-in-law bought a 4 bed, 2 bath + swimming pool in Auckland on ONE teacher salary. They currently rent it out to TWO TEACHER COUPLES!!! That's right it takes 4 teachers to afford the rent (they can't afford to buy) on the same house that once took one teacher salary to buy. And who paid off that mortgage by his 40s. Yet, it you believed the rhetoric of many of the "I GOT MINE" Boomer, you would think that somehow teachers then worked harder than teachers now and that the inequality currently crippling the lives of those under 40 was brought about by lack of hard work. Early repayment was in a large part made possible due to the fact that boomers in the professions didn't start off their young life with both mortgage and student debt. Nice example. I also assume by the fact that you are here that they had children and were still able to pay off the mortgage whereas the 4 renting teachers are childless. Sky high interest rates held house prices down and inflated away mortgages in a few short years (with corresponding salary rises) during the 70's and early 80's. Net effect was a massive transfer of wealth from elderly property owners to younger boomers. Reverse of what has happened with low interest rates of last decade. Boomers won when young and won again when old. Was watching the Vice documentary (on YouTube) of the recent Neo-Nazi stuff happening in the USA. It's very concerning that as we allow opportunity at reasonable quality life to reduce, we may well foster the same sort of social unrest here. I have worked in third world countries where the type of behaviour evolving in this election has led to violence. Think about it, if Labour is unable to deliver on promises such as houses for all, then where is the frustration going to manifest itself? A government visibly trying but going slow would surely seem to offset frustration more than one denying there's any problem, though. Oooh look it's the NZ will turn into Zimbabwe trope repackaged. No doubt we'll be Venezuela, USSR and Cuba before too long - it's the only possible end result of not voting for National, run for your lives, we're going to be taxed a bit more, the world is going to end! Heh...I'm worried...shouldn't I have received my copy of Mao's Little Red Book by now? I distinctly remember receiving my copy of Mein Kampf when National were campaigning in opposition last time round. When you've personally managed the aftermath of bombings, coups and riots you tend to have a circumspect view of the world and what human nature is capable of. Scoff if you like, but I no longer question why a friend in the Regions has a steel reinforced door to his bedroom. On a serious note I couldn't do that, so hats off to you. However, there is a huge gulf between 3rd world countries and western civilization, Kiwis much like the Brits would maybe take to the streets at a push, waving a placard saying "Down with this kind of thing", but for the most part would grin and bear it, potentially pausing to tut mildly into their flat whites. If NZ had been colonized by the more Latin Europeans then maybe you might have a point, the Spanish and French love a good riot, but there's a fair bit of British stoicism evident over here. Voting for labour is like buying something online from China with your credit card , all we have is a pretty picture, a fancy advert , some vague details and little idea as to the quality or even whether they will deliver .......... you just have to trust them . Thing is ........... can we ? ha yeah. Must be something in the water down under. Maori started it by swapping a few thousand acres for some blankies....and still it continues...a few zillion hectares and homes for some digits on a screen. The history of enslaving the locals rolls on. Voting for National is like selling your assets to China so you can temporarily spend more on your credit card. All we have had is a smiley leader (Key), fancy adverts (rowing as an 'everyman' sport?! ), some vague details and little idea as to what they've delivered (nothing of substance)........ You can't trust them. Thing is ....... why should we? But really we have been also been rather cunning in selling houses to a whole lot of Chinese nationals to bring a lot of that money spent in China back to NZ plus increase our tax-base with a population of hard working Chiwis. NZ is hard pressed to support itself of tradeable agricultural products and tourism alone, but we are too small to create large internal markets and too far away to be competitive in other global industries. Immigration has been a short term fix for that balance of trade issue, but won't work forever. Is there anything we can we do to fix that? In the old days we sent out battle fleets to plunder the world, now we sit at home and they bring the plunder to us. Or the plunderers, as the case may be. I always despair at this logic. If we only voted for experienced people then the government would never change which is the worst possible outcome in the long-term. Total nonsense . "Experienced" does not need to mean "Experienced in government". Our previous PM was experienced in finance. How did that work out? At least he had the experience to know when a ship is sinking. It worked out very well - NZ weathered GFC much better than most of the rest of the world. why would he stay? It's not like he had anything left to prove, and if he doesn't want to just retire then his impressive track record will give him the pick of plum jobs the world over. New Zealand barely had to face the GFC. Kiwi banks weren't up to their eyeballs in silly investments. Plus we rode on China's coattails. What great policies did the government implement that was so good it managed this feat? Were our ingenious policies then adopted and praised in other countries around the world? Or was it just circumstance, which would have been the same whoever was in power? Selling land and assets to foreigners? Flooding the country with low-skilled immigrants? Helping blow up an enormous property bubble? Again you show your mind blowing ignorance and comparing Aliexpress to Labour really just bites you. a) I can save a huge amount of money if I buy with care. Example I buy SS bolts and screws at <1/2 the trade price I pay in NZ. and that is the Trade price I get in NZ trade shops and not Bunnings retail prices. b) With over 450 buys I have only a handful of failed trades 75%+ of which I got refunds on. So yes sure I've lost a few dollars but frankly you get the same failure with NZ stores, in fact even worse IMHO. c) Like voting you dont look at the fancy advert you look at the feedback, ie do your research. Now the thing is the feedback is critical to the web stores survival and prosperity. They only want 5 stars or they go out of business really fast so they are usually keen to give good service. Did I mention the huge savings? and then there is the huge choice? and I mean huge unlike NZ where you have to pay a premium for the few colours and sizes they choose to sell V picking your choices from a mind blowing sized shop. So if you are comparing aliexpress to Labour, well Labour gets my vote. if you tax the family home or the one property you own and live in you will need to maintain a set of books for the house. The house becomes an investment or a business and then you have the nightmare of running a set of tax accounts for your home. That is the ultimate model in Doctor Morgan dream and what most journalists dont realise is that once you apply a tax to something it becomes the preserve of the IRD and that means a set of tax accounts. Is the set of accounts going to have a standard applied and will it be single entry or double entry......It will of course be single dimensional or multi..?. Depends on the complexity of the tax system. That is the issue with TOP's plan, it's too complex. Assume that all income is taxed as per the INCOME TAX system. We all know that capital gains on property rarely come from any personal effort by the owner. The only records one needs is the purchase price and the selling price. Pretty simple really. What about exceptions (e.g. for family home and how this is defined), capital improvement expenditure, no loss/no gain transfer rules, personal limits, carried forward losses, entrepreneur relief, rollover relief, tapering adjustments. All these form part of the capital gains codes elsewhere. A yearly assumed rate tax on capital does away with all of these and is MUCH harder to avoid. It works well for FIF shares. Outright confiscation of property would be the hardest tax to avoid ; is this therefore the best solution in your view ? I don't know where this idea that you have already paid tax on money comes from. Post-tax money either spent pays tax again or invested pays tax again (except for property you didn't expect to sell). Tax would be on net capital. Of course there isn't an $11bn hole in the budget. Taxinda will fill it with more taxes (so you and I pay) and borrowings (so we and your children and their children pay) for the votes Taxinda wants to buy now. more taxes just as china starts to slow down.. debt at 255% of GDP and china now looking at a floating exchange rate... china purchasing power dropping...fixed interest yield curve starting to tell the story now...and aussi employment out thursday... if its more lower wage jobs and consumer confidence continues to weaken in aus then growth could remain slow for the next N years... forcing more pressure on treasury to raise funds for governments ... NZ interest on bonds to increase? forcing pressure on NZ government debt ? I did the I -side-with.com quiz and I have just been and voted early ................ for Winston Peters . It was a strategic decision . I am after-all a greying Baby Boomer , so Winnie will take care of our interests .......... I hope. Reckon Bill's right. Going to be a drag race to the finish. Wonder how much of this is a consequence of Joyce's greasy propaganda re the pretend $11 billion hole. Who would have picked the Greens on the ropes? Potentially a wasted vote, as is TOP. Will be interesting to see what other polls show up with, as individual polls have swayed around. I think it would be bad for NZ to lose the presence of the Green party at this point in time. "I think it would be bad for NZ to lose the presence of the Green party at this point in time." - on the contrary - it would be a most wonderful thing. You sound a bit forlorn tonight ; I suggest rereading Das Kapital to keep the spirits up. You should be able to manage something less cliched, mate. Smarten up. A sense of humour is a serious business; it's a shame, not having one. I don't think so. If he Nats get over the line there will be post election changes in housing policy, albeit I think they are all blowing smoke up our butts with promises of affordable houses any time soon. I'm anecdotally hearing that its tax e.g. Tonight a young voter told me she couldn't support Taxinda because she would tax her inheritance. We know that's not true now, but Labour isn't being clear or quick enough to dispel these attacking points. I think you're right, Ex Expat. Whatever Jacinda dispels, Joyce will simply rock out another evil nasty tax and claim Labour are going to throw that at Kiwis, and a few more will be scared off. Propaganda at its finest. @Rick Strauss. "Will depend on young Kiwis appreciating they might have to wave goodbye to the idea of home ownership if Nats get back in..."
Even National wins the election, Bill will learn the lesson from Jacinda effect this time, and a strong opposition party will push National do something to help young kiwis owning their home. The employment mandate is the reason northern hemisphere central banks have kept interest rates down for nearly 10 years after the GFC. These low rates have sparked a property boom as in Auckland which we hear about every day in the media with the side effects of unaffordable housing, high rentals and increase in inequality etc. Adding a employment mandate to the criteria that the Reserve Bank must consider when setting interest rates will only make housing even more unaffordable as interest rates will be kept lower for longer increasing the disadvantage of those seeking to own or rent. At the same time a Labour government will make taking on more staff more difficult for existing or new employers by increasing the minimum wage, extra compliance costs, and forced industry agreements, so interest rates will never be low enough to reach employment targets. An employment mandate is a bad idea as those it is supposed to benefit are actually more disadvantaged as it is likely to further increase their housing costs.